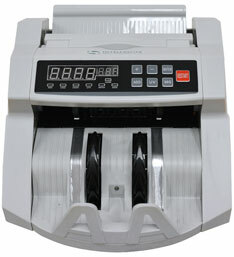 Using ultraviolet (commonly abbreviated UV) technology is one of two ways that the Intellinote bill counter machine works to detect fake bills. Essentially, a counterfeit will produce an image on the surface of the paper. This surface mounted image and the "bleed" of printer ink can be seen by the UV light. If the unit detects a suspected fraudulent banknote, the UV sensor with stop, sound an alarm and blink error message E01. The magnetic detection (abbreviated MG) function is another way in which the Intellinote bill counter machine works to detect fake bills. Within the ink used to create real currency there are magnetic fibers. When the magnetic compound is not present, that bill may be suspected by the machine as a counterfeit. If the unit detects a suspected fraudulent banknote, the MG sensor with stop, sound an alarm and blink error message E02 (as shown in the video above).